I’ve been thinking lately about science and religion. This came up first because of my church. My church has been working over the past two years on it’s strategic plan for 2010-2015 and it was mailed out a few weeks ago (to be presented this coming Sunday). I was flipping through it at breakfast a few days ago because I’m not allowed to be on my computer until after breakfast during Lent. I read over the shared values. The first are what you’d expect: Our theology, The individual, spirituality and congregationalism, Our life in community, Inclusivity, and Our action in the wider community. All of these are fairly standard in liberal churches. The next also wasn’t that surprising: Celebration of the Arts as Sacred. This especially wasn’t surprising given that all the Lenten services are revolving around paintings and poems and Palm Sunday will also have an interpretive dance. (Last Sunday’s sermon on Chagall’s The Sacrifice of Isaac 1965 was fascinating.) But then comes the final value: Affiliation of Compatibility between Science, the Intellect, and the Spirit. We celebrate the gifts of science and the intellect as well as those of the spirit, and we affirm that science and religious faith are complementary and not in conflict with one another. We honor our Congregational heritage that values life-long education and intellectual inquiry in all facets of our life together. I read this and I got excited. I read this and I thought “my church appreciates me for who I am. They recognize my talents and are putting them forward and mentioning them.” I’m used to the arts getting called out, and much as I love that, it’s just not the same. I’ve never been in a church that devalues science. I’ve been blessed to be a part of wonderful congregations that value me and my geeky brain, but that said, none of my congregations before now has explicitly said it out loud to the world- HEY SCIENTISTS, you are welcome here. And that’s cool. So with this on my mind, it’s been coming up in other places too. One of the things I’ve been reading every morning in place of my email is meditations by Madeleine L’Engle. This morning’s reading was an excerpt from Camilla about God. Frank is telling Camilla that we need a new God because our current God was designed thousands of years ago. And yet we haven’t changed our image of him at all. “And then the Victorians. They tried to put God back in a long white nightgown and whiskers again. That kind of God isn’t any good for today. You can’t blame Mona for not believing in that kind of God. We need a God for the atomic age.” Madeleine said it perfectly. Special Agent Seeley Booth: You know what if feels like to get your faith back? Dr. Temperance Brennan: When I see effects and I’m unable to discern the cause, my faith in reason and consequence is shaken. Special Agent Seeley Booth: And then what happens? Dr. Temperance Brennan: …Two plus two equals four; I put sugar in my coffee and it tastes sweet; the sun comes up because the world turns. These things are beautiful to me. There are mysteries I will never understand… But, everywhere I look, I see proof that for every effect, there is a corresponding cause, even if I can’t see it. I find that reassuring. Special Agent Seeley Booth: And life is good again. Dr. Temperance Brennan: [laughs] Life is very good. And they understand each other enough for that to be good enough, even though for many it would not be. I’ll close with the final thing that’s been rolling around in my head regarding science and religion, a prayer. This is a prayer by John Edgerton for Plymouth Congregational Church from November 8,2009. I don’t always pay much attention, but when I heard him refer to a variable in an equation I knew it was good. Thanks to John for this great mixture of religion and science in a single prayer. God of Abraham, you are the light of the world and your people love you. We have tried to be close to your light for generations beyond memory. We have sought to be close to your light in our arts, our science, and we seek your light in times when we are vulnerable and alone. We find comfort in the light of a fire. The orange and yellow and red fingers lick the night air, and our hearts are filled with an ancient peace when we sit near a fire and watch it dance. We find joy in mimicking your light in our paintings. Laying colors on top of colors we emulate the first moments of your creation. trying to bring form and light into being where there had only been a blank canvas. We decise ingenious mechanisms to try and contain and trap shards of your lights. Pressing silver gelatin between panes of spotlessly clean glass we fashion an eye with mechanics and chemistry. In darkened rooms we coas images into appearing, we treasure the photographic records of your light’s presence-shadows made permanent. Light of the world, we try in our sciences to define and objectify your light. We have given it other names-lux, photon-these names express only a portion of what your light is, but the finest name we have given to your light is simply: C. The immutable speed, light moves like nothing else in all the universe, and we base our most delicate physical calculations on its constancy. Light does not change and yet it cannot be deifined. When we try to know the most basic form of your light, to isolate its elemental nature and encompass it with our minds, your light winks at us and goes on being two things at the same time. it is the pebble thrown into a pond and also, somehow, the ripples. God of Abraham, you are the light of the world and your people love you. This is a post that’s been rolling around in my head for a while now and it may take more than one post to do it justice, but here’s the main principle. It seems like science is becoming popular. astrophysicist. By having bits and pieces of science enter the popular realm, we are condoning science as a valid career and a good option for high school, college, and beyond. Those are my initial thoughts. But then there’s the other side of me. The more infantile side. This is the side that, at some level has always been a scientist. I don’t remember my science escapades in elementary school, but in middle school I had many. I dissected salmon and collected salmon sperm for class, leading me to a decision to become a reconstructive plastic surgeon (lasting from 7th-9th grades). I participated in Science Olympiad at the state and national levels: taking tests, engineering devices, and winning medals. I participated in the state science fair and went to my dad’s lab three times a week to monitor and count seeds for my germination study. In high school, I made a cake to look like a cell and took college biology. In college, well, I was a math and computer science major. Not only that, but I was one of the first computer science majors EVER from Berea College. 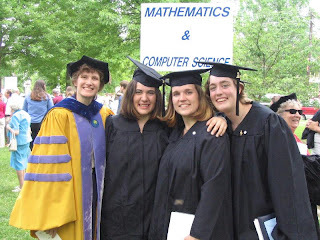 Along with my friends Bethany and Sarah we were the first people with Independent Majors in Computer Science. It just so happened that all of us were female. Here we are with our fabulous mentor and advisor Jan Pearce at graduation. In short, I’ve always been a science and math geek, regardless of public opinion. So now that the tide’s turning, I feel a little cheated. In some ways, I know that people will realize that I was ahead of the trend. Obviously I was. I’m in the fifth year of my Ph.D. program. But part of me feels like the girl who’s been listening to a band for four years and the band has just been discovered by “the people who discover bands.” I want to wear a t-shirt: “I liked science before science was cool” But I’ll settle for just going back and reading “Surely You’re Joking, Mr. Feynman!” for the fifteenth time instead.